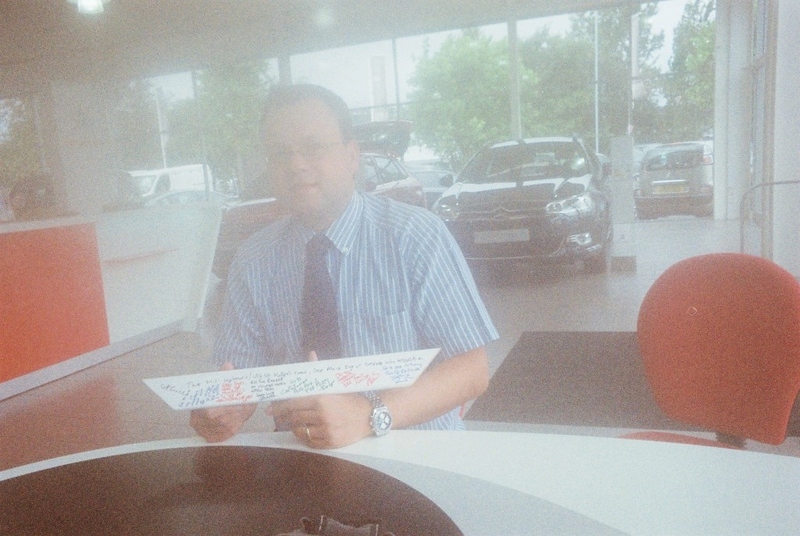 I visited Bassetts Citroen when I had a free morning off at work and was able to catch up with and meet Mr. Paul Nelson. Mr. Nelson is the manager at the Phoenix Way centre. He gave the montage a 3 inch Orla Kiely model of the Citroen DS3 as a placeholder and then sent me to see Anthony Fox at Eastside Insurance. I was told that Eastside Insurance helps supply car insurance coverage for Swansea’s Citroen Bassetts centre. At the time, my digital camera was broken and I was using the disposable I kept as standby. In the resulting photo you may be able to make out the hazy, dreamlike impression of Mr. Nelson flanked by a Citroen.